Blame Jimmy Carter for all the airline bankruptcies. Or better yet, thank him. Photograph by Bruce Bennett/Getty Images. American Airlines’ parent company, AMR Corporation, filed for Chapter 11 bankruptcy protection on Tuesday, surprising exactly no one. A major corporate bankruptcy is normally a bit of a shock, but there’s nothing shocking about bankruptcy in the American passenger air business, where filings are way more common than crashes. Frontier Airlines filed in 2008, Delta and Northwest both filed in 2005 (and later merged), and United and U.S. Airways filed in 2002 and then again in 2004. TWA went down in 2001 as part of an acquisition by the now-bankrupt American Airlines. Pan Am, of course, went out of business entirely 10 years before that, only to re-emerge as a short-lived television show about the glories of air travel in the era before constant bankruptcy. And those are only the big ones. All told there have been 189 airline bankruptcy filings in America since 1990. Why? You can blame Jimmy Carter for the bankruptcies. Or perhaps you ought to thank him. American’s labor costs are uncompetitive because it didn’t go bankrupt a decade ago when everyone else was doing it. Instead the airline and its unions reached an agreement on moderate concessions that allowed it to avoid bankruptcy. That was a point of pride for years but laid the groundwork for the airline’s current problems. Having made pre-emptive concessions in the past that saved the company, American’s unions were understandably reluctant to agree to further givebacks even though American’s cost structure remained higher than its competitors. Bankruptcy gives the company new legal options to put the squeeze on its workforce. The bankruptcies and the labor conflicts arise in the airline industry because it is not a good business. Cumulative earnings across the history of American passenger aviation are negative $33 billion. To understand the economic problems in the industry, you have to go back to the long-defunct Civil Aeronautics Board, the federal agency that used to regulate aviation. Passenger aviation clearly needs some regulation for the sake of passenger safety, pollution control, and the community impacts of airports. But in the early decades of the industry, CAB went far beyond that to regulate what fares airlines were allowed to offer and which routes they were allowed to fly. This became a classic case of regulatory capture. Airlines cared a lot about the actions of CAB while ordinary voters had bigger fish to fry. As a consequence, the board ended up creating a cozy cartel where airlines didn’t compete much and certainly didn’t compete on price. With price competition off the table, airlines invested lavishly in offering a high level of service. Labor unions got in on the act, using their clout to force managers and owners to share with workers some of the excess profits generated by CAB. And then along came Jimmy Carter. In 1977, Carter appointed Cornell University economist Alfred Kahn to run CAB, one front in an underrated multipronged Carter-era assault on cartelization that included the legalization of home-brew beer as well as more consequential deregulation of the interstate trucking and natural gas industries. Kahn was an aviation outsider, an expert in overregulation rather than the details of air travel. His mandate was to get the federal government out of the business of setting airfares. A year earlier, Sen. Ted Kennedy, with future Supreme Court Justice Stephen Breyer as his lead adviser, had begun to lay the groundwork for the change with a series of legislative hearings on the high cost of air travel. One point of note was that federal regulation applied only to interstate travel. Flights inside a single state—common in Texas and California—were unregulated and much cheaper. A flight from Los Angeles to San Francisco, for example, cost about half a flight from Boston to Texas. With the CAB headed by a man who wanted to shut the agency down, Kennedy delivered legislation to do just that. Carter signed the Airline Deregulation Act into law in 1978 and the federal regulatory apparatus wound down over the next six years. Looking back on the legacy of deregulation in January of this year, Breyer observed that “airline revenue per passenger mile has declined from an inflation-adjusted 33.3 cents in 1974, to 13 cents in the first half of 2010.” This steep reduction in fares has been a triumph for passengers, especially tourists and families. A cross-country flight to join in a family holiday celebration is now easily within the middle class’s grasp. The story of airline deregulation is, in many ways, a cheering antidote to ideological bickering and cynicism about the political process. But the lower fares do come at a cost: lower wages and worse working conditions for employees. Breyer says now that “no one foresaw” how much deregulation “might unfairly harm workers in the industry.” But it’s difficult to see what was so unforeseeable about it. Back in the old cartel days, labor and management were fighting over how to divide the extraordinary economic surplus granted them by regulators. Introducing competition lowered fares and eliminated the surplus, forcing the rounds of givebacks, bankruptcies, mergers, and liquidations the industry has been experiencing for decades. 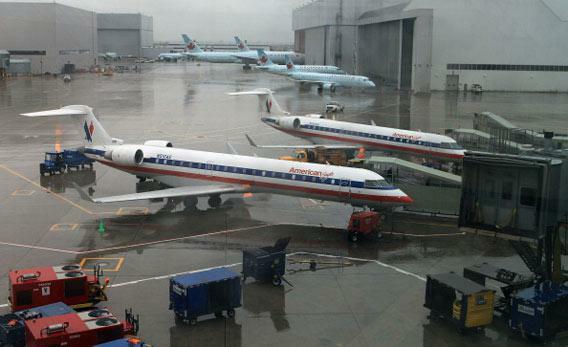 American’s bankruptcy has sparked immediate speculation about a possible merger with U.S. Airways.